Pirates, Food Trucks and Ice Cream: What's Happening in Birmingham this September | Infomedia, Inc.
Use our September calendar as inspiration for your blog and social media content. The leaves are changing. The air is getting crisp. The kids are back in school and football is back on (finally!). As we enter the final quarter of 2017, fall is in the air, smelling faintly of pumpkin spice. 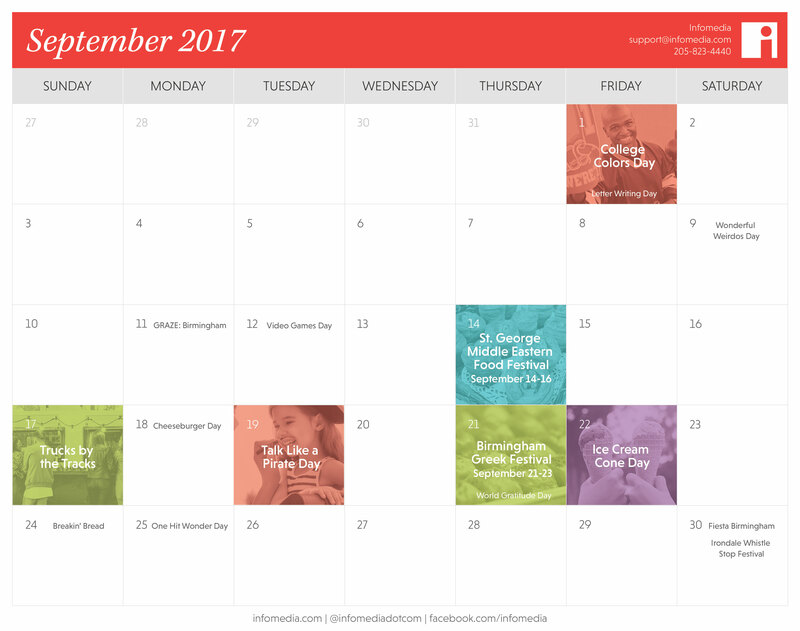 Our free September calendar is available now to help you embrace the season and boost your content strategy. Show off your support for your favorite college team during College Colors Day (September 1): It’s the perfect excuse for a fun Friday office party. If filling your Instagram feed with Birmingham’s best food is your thing, hit up GRAZE Birmingham (September 11), Trucks by the Tracks (September 17) and the Birmingham Greek Festival (September 21-23). Bond with your tribe this month, by expressing your thanks on World Gratitude Day (September 21) — or Wonderful Weirdos Day (September 9). If you’re all about gaming, celebrate Video Game Day is September 12 with a blog post of your favorites. But if you’re feeling especially analog, send a friend or loved one a handwritten letter on Letter Writing Day (September 1).